As I look around the organized chaos of my kitchen, I think to myself for the four hundredth time this week that moving sounded much easier in theory than it really is. Still, I feel some satisfaction from the sense of packing things up carefully, labeling boxes neatly and itemizing them so I know exactly what needs to be unpacked first. What surprises me most about this whole process is the sheer volume of STUFF I have kept stored in a closet or hidden in a cabinet that I don’t really need. STUFF that, when forced to choose between packing and moving it or getting rid of it, I decide to get rid of it. If it wasn’t important to begin with, why did I hold on to it for so long? I’ve donated or thrown out old plastic souvenir mugs from a cruise to the Bahamas (15 years ago), beach chairs that we haven’t sat in for over ten years, an old barn bucket from when I had horses (eight years ago? ), a few pairs of shoes I thought I couldn’t live without and yet never seem to wear, about a hundred CDs (some of you reading this will have to ask Google, “What is a compact disc?” to understand that! ), and on and on. Honestly, I wouldn’t have called myself a “pack rat” but it is incredible how much old stuff I had accumulated over the years that I didn’t really need cluttering up the house. Too often, we tend to hold on to “things” for any number of reasons: sentimental souvenirs, things we “might” need someday, or things we just aren’t ready to let go yet. But, how often is all that old stuff just weighing us down or cluttering up our environment? And, doesn’t it feel so GOOD when you do clean out the closet or garage? This is true on an emotional level too, not just a physical level. We tend to hold on to emotional STUFF in a similar fashion: relationships that aren’t serving us any longer, painful words or deeds that we wish we could take back and “do-over,” and old hurts that we need to forgive and move on. The past is just that – past. While we need to remember the past and learn from it, it’s important to move on from it. 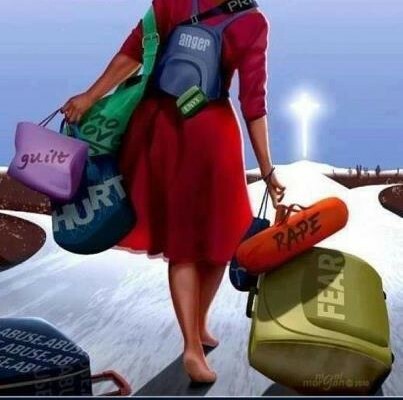 Don’t let old emotional baggage weigh you down or clutter up your life today. Sometimes we have to let go of something behind us in order to grab on and hold on to what’s in front of us! Like many, Ria faced adversity in life. Ria was sexually abused by her father from age 12 - 19, forced to play the role of his wife, and even shared with other men. Desperate to escape, she left home at 19 without a job, a car, or even a high school diploma. Ria learned to be resilient, not only surviving, but thriving. She worked her way through college, earning her MBA with a cumulative 4.0 GPA, and had a successful career in the corporate world of administrative healthcare. Today, Ria is a motivational leadership speaker, TEDx Speaker, and author of 10 books, including Leadership Gems for Women. Ria shares powerful leadership principles and tools of transformation from her journey to equip and empower women, helping them realize, optimize, and maximize their leadership potential.